This week we are featuring a Guest Blogger, Rick Stiggins. 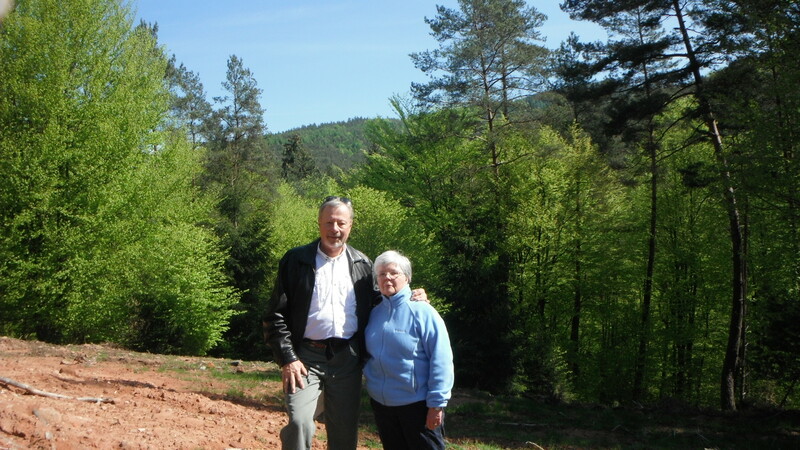 With the assistance of Willamette International Travel, Rick and his wife Nancy traveled to France in the summer of 2012 to find the final resting spot of Nancy’s father, who died in World War Two. My wife, Nancy, was conceived in 1943 and her dad, Captain Robert Cannon, went to war and never returned. He died in the Battle of Riepertswiller in northeast France on January 17, 1945—within a few months of the end of the war. He was a decorated and highly-respected officer who refused his general’s orders to return home—he would not leave his comrades until the war was won. Though she had never been held by her daddy, Nancy has always felt a very close bond to him and has always wanted to visit the place where he fought his final battle. With the help of Willamette International Travel, she got her wish on Armistice Day, 2012. Nancy’s Mom had been contacted after the war by a retired officer who, in conjunction with the Department of Defense, was researching that particular battle and who requested details about her husband. Inspired, Nancy later discovered old family files that included the officer’s detailed day-by-day description of the battle. Captain Cannon had led his 45th Infantry team up a small valley in the countryside just outside of Riepertswiller, intending to rescue a surrounded unit at the head of the valley. Unfortunately, they were overwhelmed by German forces and he died on a hillside in the winter snow. The report included a hand-drawn map revealing where he had died. Using Google Maps and Google Earth pictures, we tried to match the terrain around the village with the geographic features of the map. The Defense Department also provided maps of the changing battle lines during January, 1945. With all of this background information in hand, we teamed up with good friends from Geneva who were fluent in French, and headed for the Alsace-Lorraine region of France. We arrived in Riepertswiller on a bright May morning to begin our search. Prior contacts with the local mayor had revealed that the only local person who might have been able to help us was away. So we were on our own. We found one small valley on the edge of this beautiful little farm village and start comparing our map with the features of the landscape—but they didn’t match. We moved on. Just a bit farther north of town, we found our target—a lovely, thickly forested valley with three hills on the right. Her father had died on the third hill. A logging road provided our hiking pathway and we were able to get very close to this hillside. If one’s spirit were to be located in one place for eternity, it would be hard to find a more peaceful or beautiful place. Nancy had brought with her a small plaque to honor her hero. It said in French, “The most beautiful things in the world are not those that we see, but those that we feel with our hearts.” We attached it to a tree, spoke a few words to and about him, cried, and went away feeling that we had fulfilled a lifelong dream. Later in our journey, we traveled to Normandy where we learned about and thanked many more heroes. Theirs was a special generation. Rick and Nancy finished their trip with a week in Paris and days in Vaux le Victome and Normandy. We at Willamette International Travel frequently work with travelers to customize itineraries based on individual needs and preferences. Call us at 800.821.0401 or email info@wittravel.com to start planning your custom trip today!